You hear it often in sports and business. No longer are people from a place, they are out of it. It used to be that if a person was born in, say Philadelphia, you would you would refer to them as so and so from Philadelphia. It was simple. A business based in Omaha was said to be from Omaha. From. But the trend has changed. You hear it often in sports and business. No longer are people from a place, they are out of it. Thoroughbred horses for instance: Cocoa Balls out of Dusty Cheeks and Maiden’s Hat. In this case, given the birthing process, Coco Balls really was out of Maiden’s Hat. The starting quarterback is out of Michigan State. He works for a company out of Chicago. There was a time when this phrase was used solely by animal breeders. Thoroughbred horses for instance: Cocoa Balls out of Dusty Cheeks and Maiden’s Hat. In this case, given the birthing process, Coco Balls really was out of Maiden’s Hat. And what about popular culture? Should we retrofit titles from the past? The Man Out Of U.N.C.L.E.? Out of Here to Eternity? Far Out of the Madding Crowd? What was wrong with the word from? For that matter Out of Africa could be simply From Africa. And when did someone decide to put a D into the word important? So many people seem to think the word is impordant. And when did someone decide to put a D into the word important? So many people seem to think the word is impordant. You hear it on the bus, on radio and television. “This is a very impordant day for weasels.” There is no D in the word. We used to have an exercise in grade school that involved tapping your hand on the desk while saying various words. We were taught to enunciate the word important with an emphasis on the last third beat; namely “tant”. The most important part of important has been altered recently. Likewise, the word student was vocalized with one beat. The two syllables run together. Today that word sounds more like “stu-DANT”. On the front page of today’s Montreal Gazette there is an article about yesterday’s protest at McGill University. Concordia and McGill students decried the schools’ administrations lack of action on sexual misconduct accusations. Clearly an issue of great importance. But let me disrupt your thoughts on these allegations for a moment and turn to another important issue; grammar. The photograph above accompanied the front page story. What caught my eye was the poster asking “Who are you protecting”. Aside from the lack of a question mark, I wonder if “Whom are you protecting?” would have been a better choice. In the 1950s Johnny Carson hosted a game show called Who Do You Trust which is often cited not just for Johnny’s witty retorts, but for the grammar question. So, “who are you protecting” becomes “are you protecting he?”Nope, that’s not it. “Are you protecting him?” makes a better sentence, which means whom is the way to go. As a graduate of McGill I can only hope the holder of the poster is a Concordia student! When I was a boy going to grade school, way back when dinosaurs roamed the earth, tramping five miles to and fro, somehow uphill both ways, they taught us English grammar. We parsed sentences and memorized irregular verbs til the cows came home. They pounded rules into our fertile young minds, then just as hard they pounded in the exceptions. One of the rules that was driven home was the concept of possession and the apostrophe S. To indicate possession an apostrophe S is added as in Bill’s desk or Mary’s car. The exceptions were words that already ended in S or X, such as Alex’ shoes or Gus’ cookies. These exceptions were pronounced as if there was no apostrophe: I really enjoyed Gus cookies, not GusES. All was well until some kid went to London and visited St. James’s Park, located a mere jeweled-orb’s throw from Buckingham Palace. This certainly put a spanner in the works.The recent release of the film Bridget Jones’s Baby has given me pause for thought. So I did a little research. 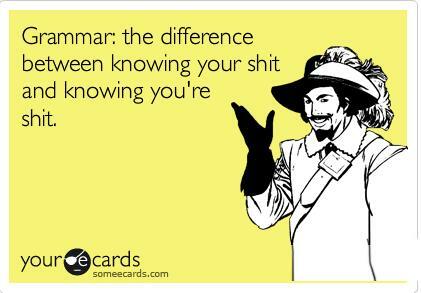 According to Mignon Fogerty, Grammar Girl at QuickandDirtyTips.com it is all a matter of choice of style. The Associated Press Stylebook recommends the method that I am familiar with, no added S, just an apostrophe, while Fowler’s Modern English Usage suggests using the additional S.
That is fine and dandy for the written word, but when it comes to saying these phrases we were taught not to emphasize all those S sounds. So while I would write the name of the film Bridget Jones’ Baby I would pronounce it Bridget Jones Baby. Scotiabank: You Cannot Be Both New and Improved! In a current television ad for Canadian bank Scotiabank there are two very irksome aspects. Yet again I find myself pointing out that it is impossible to be both new and improved. Someone once asked Formula 1 race car driver Jacques Villeneuve if he gave it a little something extra when he raced on the track named for his late father. He casually answered “No”. Further explaining that if he could give something extra in one race, he was not doing his job in the others. He was stating that it was incumbent upon him to give 100% at all times when racing. I think the Scotiabank folks might want to reconsider this ad, as it implies the adviser only did what she was supposed to do because the guy needed a few bucks, when she should have been doing it all along. Author DCMontrealPosted on January 11, 2016 January 10, 2016 Categories Advertising, DCMontreal Commentary, DCMontreal Light, Humor, Marketing, Media, Misused words, Opinion, Public Relations, TelevisionTags Advertising, Grammar, Scotiabank2 Comments on Scotiabank: You Cannot Be Both New and Improved! Here I go again. Just when I thought it was safe to read packages once more I was confronted with yet another “new and improved” claim. An entity can no more be both new and improved that can it be both round and square. By trumpeting the improved nature of the product the advertisers imply that an earlier version existed and has been improved upon. Yet if the product is also new, what is being improved upon? The photo on the left, claiming to be both new and improved, is an annoyance to me. The photo on the right explaining that an existing product now has a new look, and has been improved upon is anything but an insult to my intelligence. I don’t know how my Francophone colleagues feel about the word ‘look’, but from a proper English point of view it is an exemplary bit of marketing. Sorry about riding my hobbyhorse yet again, but blame the Brita people, not me! 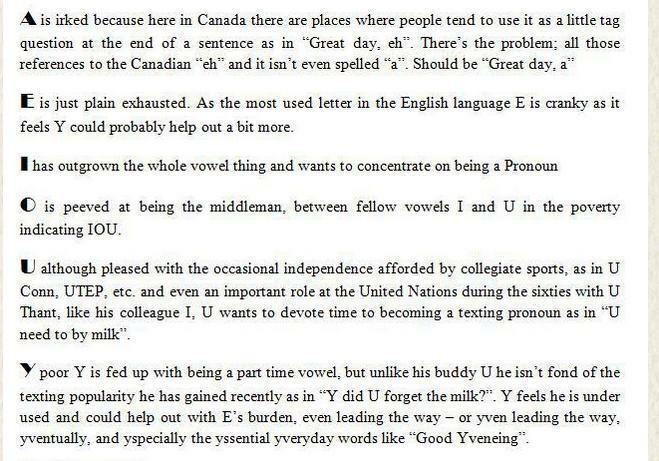 Irritable Vowel Syndrome – something has to change yventually!